This card used the Adirondack Chair from Asela's "The Journey", I masked it to make the pair sitting here in the Pure Luxury Soft Sand. Base and mats are Garden Green, and embellished with the new adhesive nail heads. A couple months after my husband and I began dating 13 years ago, he built two Adirondack chairs, one for each of us, to sit on the porch together. Like me, he likes making things with his hands. He's a man of few words, but this romantic gesture was loud and clear: he would provide a place for me and we'd always be together. In these low slung chairs you can't help but relax, and talk about happy times past and dreams for the future. We still have these chairs, they have been repainted three times. I'm glad he's a handy guy and knows how to fix things, so we can keep these chairs through whatever repairs they'll need and our memories of sitting in them forever. They've been dragged all over our yard, to find the shade or get a better view of the kids, but we always keep them together. Most often they are parked in front of the Koi pond he dug and landscaped himself 6 years ago, shortly after the birth of our first child. He had just gotten laid off, and decided it was the perfect time to spend a lot of money building a pond, which he had always wanted-now he finally had the TIME to do it! (He's an eternal optimist.) With me not working and a newborn, I had to hold my breath and tongue about the wisdom of adding a pond then, but of course he found another job (better one) soon after, and that pond is still one of our favorite things about our home all these years later, it has given us thousands of hours of enjoyment. It was a great investment. Every 3 years or so, the chairs need a new coat of paint or a bit of wood filler to heal the occasional crack. To me, they are kind of symbolic of changes that seem to happen in life every few years for our family, the good and the bad, the blessings and surprises; we weather through them. These are just a few reasons why the best part of me is my husband. On today's sample I used a corner rounder on the bottom of my card base and some Nestabilities to frame up the "Arranged with Love" image. Let me show you how easy it is. If you have Nestabilities, it is very likely the Scalloped Rectangles are part of your collection, they were one of the first few sets I bought, as most stamp images fit and frame nicely in a rectangle and look so elegant in this classic shape. 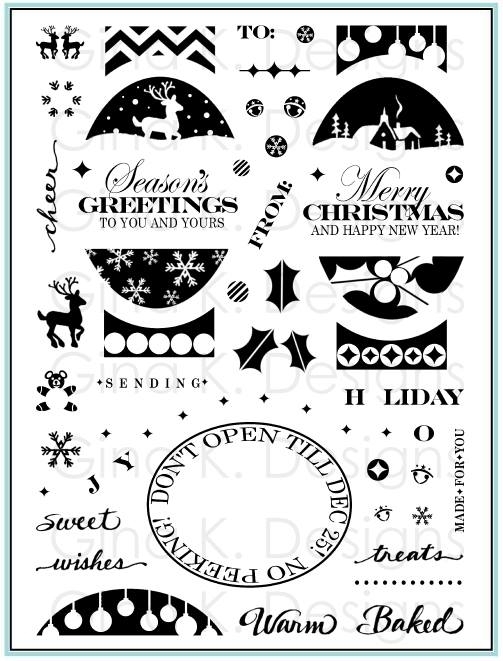 To perfectly frame this large image, trim the stamped image on the line. Die cut two of the largest Scalloped Rectangles of the same size, here I used Pure Luxury White. Then overlap them and adhere the first one over the top three humps of the second, lining the scallops up on both sides. The seam will not show once you place your image over it. I used a pastel pink scheme for this card and added "Congrats!" to celebrate the arrival of a baby girl. The butterfly is from "Take Flight", covered in Stardust Stickles. 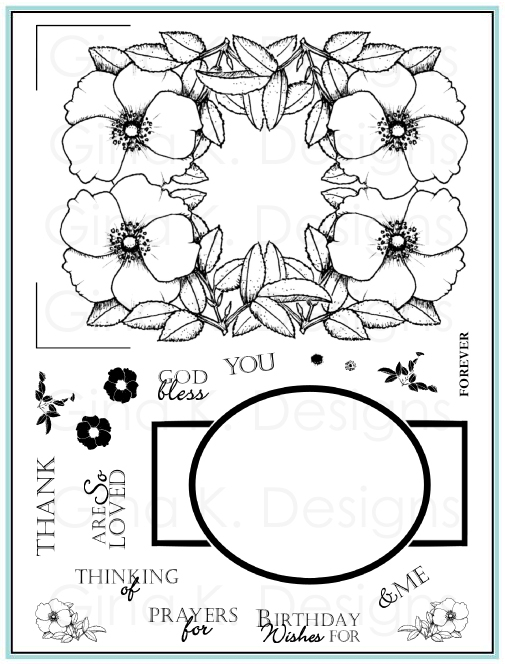 Here is a sample showing both how you can dress up the "Arranged with Love" stamp with single flowers from "A Year of Flowers", as well as mat it on a larger card. I chose earthy colors and the sunflower for a card that would be pretty for summer or fall. The popped up sunflower covers the flower underneath and dips down below the border. One this 5x7 card (Garden Green 10x 7", scored at 5"), I now have room to use two of my greetings on the front, I chose these two sentiments to celebrate an anniversary. "Congrats!" fits perfectly along the bottom. More flowers are stamped inside with Versamark. The frame is stamped in Memento Black on one of the "solid" distressed sheets from a Basic Grey pack, colored with Copics and mounted on Pure Luxury Black Onyx. This week I will be sharing how to mat this onto Nestabilities and using Peerless Watercolors with it. :) Happy Sunday! My son Jonathan has a swim met today (wish him luck!) so I thought I'd share a swim card. The volleyball and goggles are from "Sporty Accessories" and sunglasses, covered in Crystal Lacquer, are from "Little Tees". Greeting is from "Lazy Days of Summer" (BTW, so far our summer has just been HOT (106!!) and anything but lazy, I feel like a professional chauffeur carting the kids around to all their activities and practices!!) The beach towels are Basic Grey Lime Rickey DP. Base is Rocket Red and the ruched Khaki Crepe CS is from Paper Temptress, it has some really fun ripples that looked carved into the shore by the wind and water. TIP: Paper piece the space inside the goggle straps if you are placing it over a patterned paper, this is easier than trying to cut out those tiny areas! 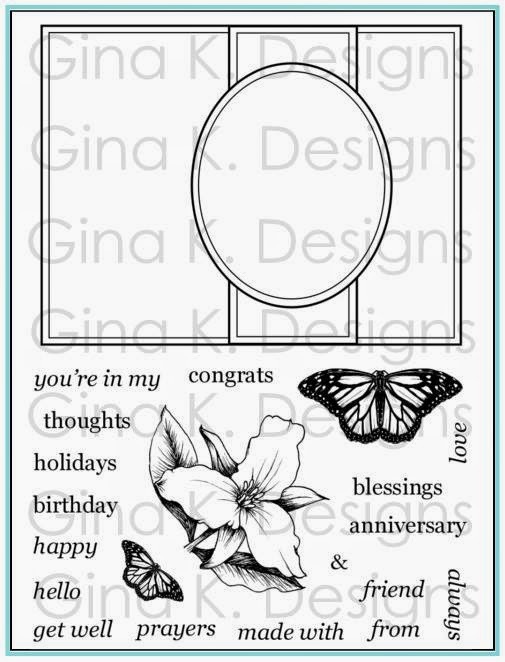 Our last two Gina K Designs stamp set peeks before the reveal tonight and I've gotten some clean and simple cards for you! The first is Asela's "The Journey". Lots of very poignant vignettes and sentiments included, here's an image I like a lot, because of the sweetness of the pair, but also the ambiguity their walking away from us creates: you may see two children, or if you're "petite" like me (and have a 6 year old son that's already up to your shoulder! ), you might see a mother and son. We just returned from the beach a few weeks ago, and we just love walking up and down the beach together finding shells, so I knew as soon as I saw this image (and the new Gina K Pure Luxury "Soft Sand" cardstock!) what I wanted to make. Next up is Gina's "Many Wishes", full of dandelions and dreams. Here is a simple single layer card created by stamping and stamping off the different dandelion heads in Staz On on Glossy CS, then matching up the stems to each, tilting them this way and that make a soft breeze. I added a little more greenery from Gina's "Tropical Flowers" to flesh out the field a bit more. I sponged on a bit of pink and purple allowing some white to peek through, I love doing nature silhouettes like this with sky in the background, like you're lying on your back in the grass with flowers towering over you as the sun sets. She also included lots of different wish greetings to accompany those little spores floating away in the breeze... ahhhhhh! Our CenterStage Spotlight Design Team members Selma Stevenson and Pam Imholz are joining us this morning with previews as well! The winner of my new "Arranged with Love" set goes to Stephanie B. with this beauty of a card you see above!! I just loved the pinks and oranges with the neutrals and all those repeating circles: the flowers, their centers, the spots on both the DP and the spiral clip, it just had such a fresh, modern, cheerful feel! And the pale pink envelope to go with was such a fun touch! Congrats Stephanie! Please send me an email with your contact info to make arrangements for you to receive the new set! I'm one of the few who doesn't own this set. But I'd love to win a new set! Being unemployed isn't fun! Congrats Teri! Please email me with your address and let me know whether you would like the"A Charmed Life" or "Sporty Accessories" set! 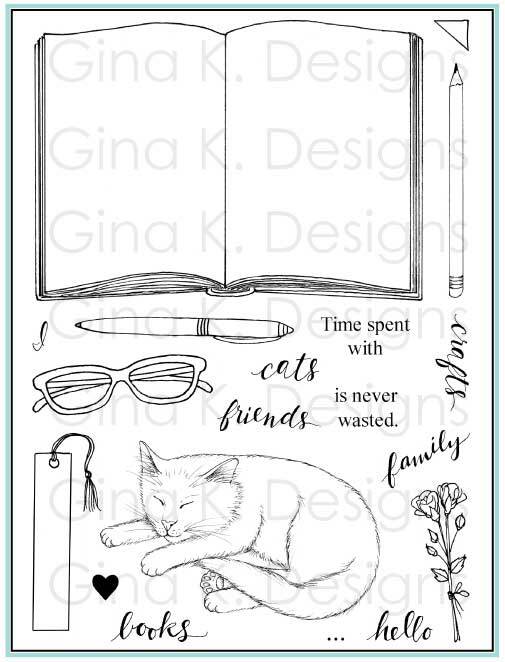 Please scroll down and see two sneak peeks if you have not already gone on our Gina K hop today! Next two peeks at midnight CST! :) we are less than 24 hours away from the PAR-TAY!!! Sneak Peek Day 2: "Arranged with Love" and "Bug Me Anytime"
If you're familiar with my past stamp designs, you know I love elemental sets that allow you to create different compositions with the images to suit a certain style, mood, or layout. One of my favorites, "A Year of Flowers" is one that lends itself to the very simplest designs, with a single bloom on a one layer card, all the way to a very intricate arrangement using every blossom and leaf in the set LOL! I love how you could never make the same card twice with it. 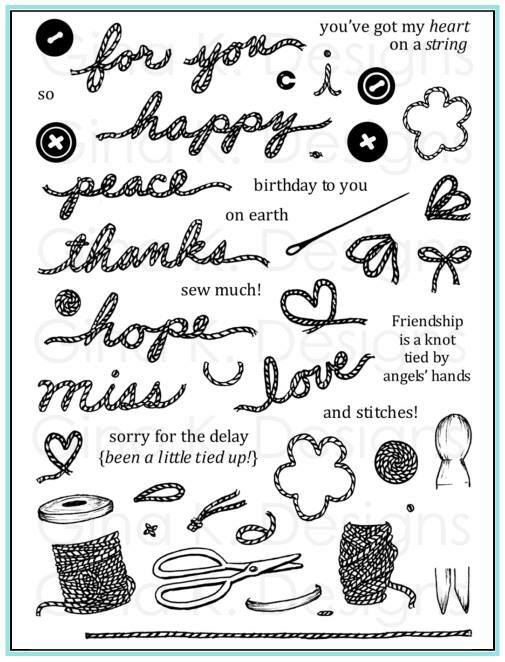 But sometimes when you stamp, you don't want to think (about: Where does the embellishment go? What layout should I do? Where is that mask again?? Where is my mojo...?!) you just want to stamp and color. I get that. (Sometimes, me, too!) This new set is for you! 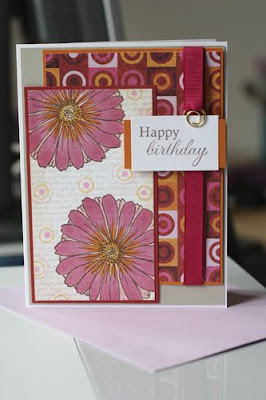 :) The sample below is a TWO LAYER CARD, made from just TWO stamps! In my newest set "Arranged with Love", releasing this Thursday from Gina K Designs, I have taken all the time and guesswork out for you with this large frame stamp image, which I painstakingly arranged and edited a few of my favorites from "A Year of Flowers" to give you an extravagant, layered-looking bouquet, ready to layer onto your card front, that you can send for any occasion, year-round! It's like sending a real bouquet! The framed flowers image has a tiny blank "card" nestled in the center, and I've included 10 different greeting options for all occasions. You will adore the large, elegant font. I colored this with Copics and trimmed it with a pair of postage edge scissors, it is so easy to change the look with decorative scissors and sooo easy to cut, just follow the line! Card base is Pure Luxury Rocket Red. These are stamped with Vivid Brick on the new Gina K Pure Luxury Soft Sand CS, layered onto Rocket Red and Ivory. I stamped just the little greeting card in the middle onto the Ivory CS and cut it out to layer on top so the greeting would really "pop" off the darker paper. There is just one of the new 2 mm self adhesive rhinestones at the top corner of each for some bling, that tiny sparkle adds so much! "Arranged with Love" is a wonderful stand alone set, but also the perfect companion to your "A Year of Flowers". By using a single bloom to decorate the inside of the card or your envelope, or if you don't see your favorite flower in this new set (or want to change this up to match your season, for example: sunflower for fall), simply cut one out and pop one into this arrangement, it will fit right in! :) Here I've stamped the frame image directly onto my card base and turned it sideways, then covered the little sentiment card with some masked "A Year of Flowers" lilies. It's like custom DP for the first set, but in a frame! I also stamped the frame onto the back of my envelope. This is a really nice way to match the card when you're going to be hand delivering it, rather than just writing the name! Below you can see how I stamped the individual lilies on the flap to decorate the back. I stamped the background one more time on some white CS and in plum ink and stamped another greeting from the set over it in Memento Black. The next peek is the new set from Nina Brackett: "Bug Me Anytime". It is such a fun, funky set! It includes flower parts and pieces so you can make your own modern-looking arrangements, plus, of course, BUGS!! I stamped the big dotted strip from "Ribbon Stripes" for the side and bottom , it is such a nice match for the large dots that accent the majority of the images in this set, and the ladybug! So cute!! This time I used Almost Amethyst with the Rocket Red and I am lovin' this color combo! Sneak peeks have begun, ooh the excitement! First up is Theresa Momber's "Happy Camper". What a great outdoorsy set to follow up "Out West"! You also get to see some of the new Pure Luxury Soft Sand from Gina K. It is a fabulous neutral, here paired with White and Black Onyx. This card was inspired by a beautful wine and dessert bar I discovered this past week "Viva Chocolate!" (my kind of place!) I pulled out my Basic Grey Bittersweet papers to create the scene. Isn't that cake heavenly? ("chocolate raspberry truffle" hee hee!) I love the little "two forks, please" image. :) I made the plate with an oval Nestabilites die and added a "folded napkin" made from a 3" square of Pure Luxury and my Scor-Pal! Of course you need some coffee with your cake, and Rupa's cups from another favorite "My Cuppa Joe" are just right! 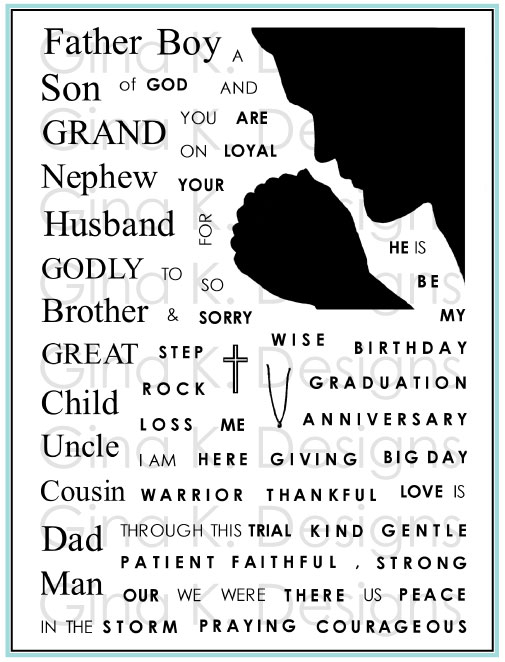 The sentiment is framed up with Long Rectangle Nestabilities to look like a wall hanging. More peeks from our Gina K team!! 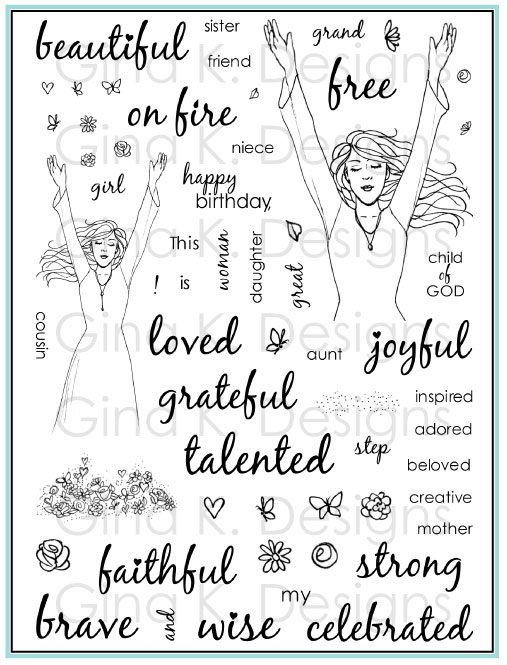 Mark your calendars for the Gina K designs release and party (this link explains the what's to expect!) this Thursday night, June 25th! Reminder: You still have a few hours left to enter "A Year of Flowers" project for a chance to win the new set, click here to upload before 11 PM CST! Here is a book mark I made with "Sporty Accessories", "Ribbon Stripes", ribbons and papers from the "Eclectic Summer kit", star from the "Lazy Days of Summer" Free with Three set (only free for a few more days, next release is Thursday!) Yup, I managed to get almost the whole release on this one project! LOL!! Just love how well it all goes together. :) "You're A Classic" greeting to go with the classic Chucks is from my "Tee Talk" set. Only 5 more days til our next release!!! I am going to say: one of these new sets contains probably my favorite image in my entire collection of stamps! and I have a TON after 6 years of collecting! So excited to reveal it to you!!! Hello! 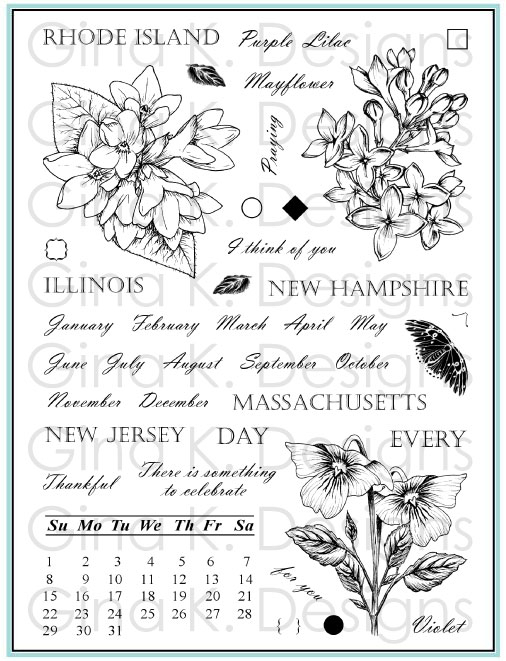 Today I am pulling out a favorite set I have not had time to work with in the past few months since I've been so busy with all our other new release Gina K Designs sets: "A Year of Flowers"! (blog hop info follows sample) I've been meaning to make "a dozen roses" for awhile now, glad I saved it for today, this is my first stair step card! Score a 5 x 10 1/2" piece of baseweight Pure Luxury White at 1 1/4", 2 1/2", 4 1/4", 6", and 8 1/4". Fold. 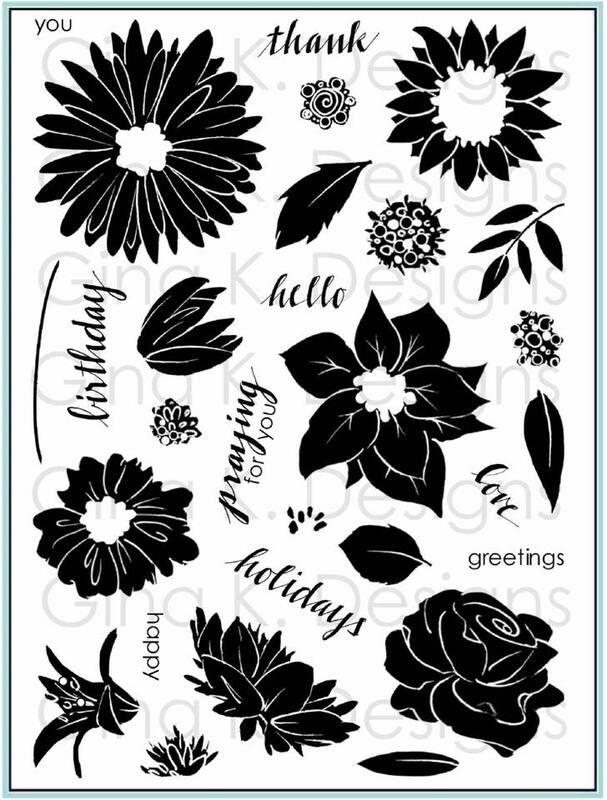 Now stamp out three rows of roses on another piece of CS in Memento Black, masking them to fit within 5 1/2"(so it will fit in your A2 envelope) and mask in the leaves. Here you can see my scrap mask covering one rose so I can stamp the leaves. I did 3 in my bottom row, 4 in the second, and 5 in the third for a total of 12. Gotta go for the full dozen! :) Masking will save a lot of time in just cutting the three orws and not having to cut out and adhere 12 individual flowers! I only used 4 Copics for this card, 2 greens and two reds: Grayish Olive and Lime Green for the leaves, and Lipstick Red and Cardinal for the roses. Coloring went very quickly. Then I cut each row out and adhered to each step. You can go back in and adhere some more leaves behind the layers if you want a fuller bouquet. NOW! Please come join me in a flower blog hop as I try out the Mr. Linky for the first time! Please share your new creations (cards , pages or 3D items) made with "A Year of Flowers", through June 22nd, and we'll hop around and watch the flowers bloom all weekend! ( I think by now just about all of you have this set, right, show of hands??) Only requirement is incorporating this set, links that do not follow the challenge or are found inappropriate will be removed, thanks in advance for following these simple rules! I will pick one winner to receive a copy of my new set (and you WILL want it, NEED it! 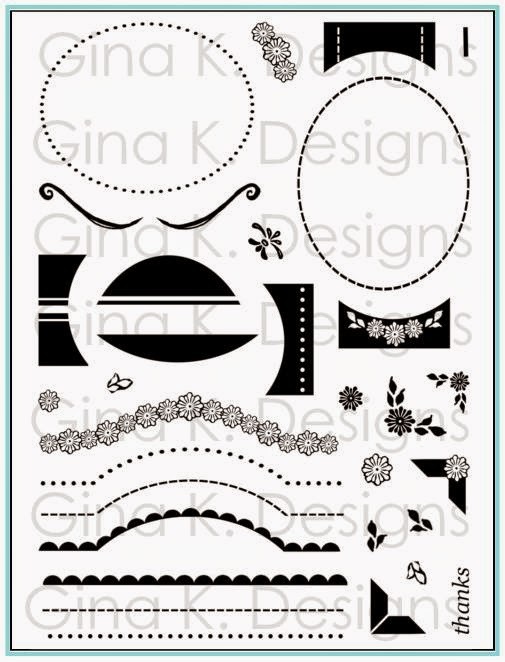 ), which is releasing June 25th from Gina K Designs. Winner will be announced here June 24th, the day we peek the new set in our design team blog hop! If you don't have the set or can't participate, you can still get a chance to win a copy of "Sporty Accessories" OR "A Charmed Life", your choice, by visiting the blog links in the hop and then leaving a comment on this post. Good luck! Wild, wild, guessing here. We have had wee tees, teen tees, adult tees==how about something for us fun loving senior citizens? 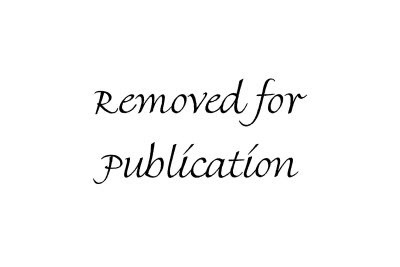 Congrats on your publishing achievements. I'll be sure to check them out next time I get to a "big" town that has book stores. Congrats, Darlene! Please email me your addy and I will send you your prize! Didn't win this time? 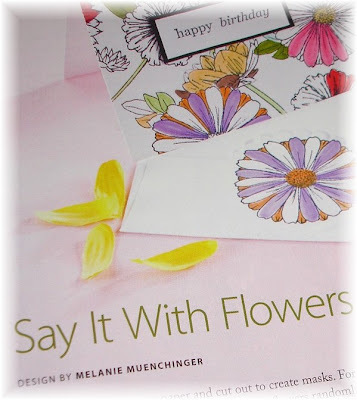 Play my flower blog hop challenge for more chances at prizes, it's posting in just one hour!!! Look at this fun golf project from Tina! The layout she's created with the "Sporty Accessories" clubs is so sharp and the argyle paper is perfect with it. She stamped the label image from "What's in Your Tin? 2" directly onto the DP and trimmed to make the cover for this little golf tee and pencil Altoid tin, I just love that idea, fun and practical, and not hard to duplicate! Labels: Gina K Designs, Guest Designer, Just So Sporty, Sporty Accessories, What's in Your Tin? Here is a card I made with the "Stamp TV kit Eclectic Summer". The turquoise DP is Emily's Bright Summer Grunge, and I colored a white paper flower with Copics to match the copic colored flowers in the bucket. A little hemp tied around the bucket adds some texture. TIP: Choose DP to go with your image that has a subtle "matchiness" to the pattern, here the flower centers are really fun with the polka dots, instead of choosing a floral pattern. I punched some ovals from celery CS for the leaves and swiped my Garden Green pad over them to match the fun green Basic Grey Lime Rickey paper, also from the kit. Brown layer is Pure Luxury Chocolate Kiss. Please leave me a comment on this post with your guess about what I might be doing for my next stamp set (releasing June 25th! ), I will pick one random winner to receive a signed copy of the magazine and the web bonus sheet, along with the original signed card and envelope you see above! This candy is open until June 17, 11PM CST, winner announced the following day! Here is one of my last "So Sketchy" Challenges to end my 6 month So Sketchy run as a "Sistah", it's been a blast! Be sure to visit the Sketchy blog for this particular sketch. The different horizontal strips inspired me to use Theresa's horse from "Out West" set and create some bridle straps, I used Gina K's "Ribbon Stripes" for these as well as using the diamond stripe image to create a faux bandanna patten on the Pure Luxury Rocket Red CS by stamping it in Vivid Coffee Bean and accenting it with the Inkssentials White Pen. Base is Pure Luxury Chocolate Kiss. I rubbed ghe pad directly onto the paper to give it this suede look (such a velvety, juicy pad!) and then distressed the edges. The different buckles are from the SU! Antique Brass Hodge Podge kit. More later, I just got back in town from a long weekend, lots to do!!! Have a great day!! 1. Look at the texture of the fabric and consider how well it will pick up the details of your stamp image. The champagne tie above is silky smooth, you see every line of the golf club. 4. If you do go with a solid tie, collage stamp several images randomly to create a "background". Then you can go back fill in areas that have too much space later. Hope this inspires you to try some ties! (I also made some sporty boxers! Wouldn't these "Sporty Accessories" make fun underwear for your little athletes?) They came out as nicely as I imagined they might, and at $8 a piece it was the worth the risk of trying a new article of clothing as my stamping canvas! I'm really excited to be able to make more of them for sports enthusiasts, and proud to present these two to the dads in my life! Talk about a one of kind, personalized gift! Here are spinner cards I made for my son Jonathan's coaches at the end of the soccer season. I punched out the balls from "Sporty Accessories" with a 1" circle punch and made the spinner with the SU! Word Window punch. His team was the "Yellow Jackets" and they had those beautiful shimmery yellow jerseys so I made the stars, jersey from "Just So Sporty" and card base from Paper Temptress Gold Metallic paper, these metallic papers are GREAT for sports jerseys! (and are on sale this month!) I stamped "#1" and "Thank U Coach" from the same set and drew some wrinkles around the jersey outline with a yellow Koh-i Noor to give them some depth. TIP: Use Staz-On Ink with these metallic papers , some inks are slow to dry on this specialty finish and can smear or not show up as well, but Staz-On dries instantly! For a spinner card, you need two pennies and two pop dots, the stack goes in this order: stamped image, pop dot, penny, pop dot, punched slot, penny! Today Tina mixes it up: "Sporty Accessories" and "Wee Tees"
This card is actually a birth announcement, the front has a very clean and simple design with the onesie, a nice little baseball background and "It's a boy" from "Just So Sporty". I love the summery, patriotic colors and elements she used (my older son has a July 1 birthday, so we've had quote a few red, white and blue parties here!) ;) Cardstock and ribbon from the Stamp TV kit "Eclectic Summer", DP is the free "Stars and Stripes" digital paper. Don't you LOVE that bat design for each line item?? (and it keeps your handwriting straight LOL!) The lbs and ounces, my mommy and Daddy and world's cutest are all from "Wee Tees", the meagphone is such a fun way to way to make this very important announcement at the top! I thought the little cut-out racket pair together from "Sporty Accessories" would be fabulous as a heart! Images are stamped in Memento and colored with Copics. TIP: When mounting the rackets over a colored CS, color through the netting in a color to match so it looks like the racket is really strung and you're seeing the colored CS beneath it! Red CS is the new Gina K Pure Luxury Rocket Red, die cut with a Nestabilites heart. The tennis ball is popped up on the racket and then stamped and colored along the bottom, kind of like a brad or eyelet border but much easier! I love all the texture (and perceived texture!) on this card. The white background paper you see is the new "Summer fabrics" digital paper, you can print your own canvas FREE, isn't that beautiful? The striped ribbons are from the new StampTV "Eclectic Summer" kit. Base is Gina K In the Navy. Have a great day, love you! 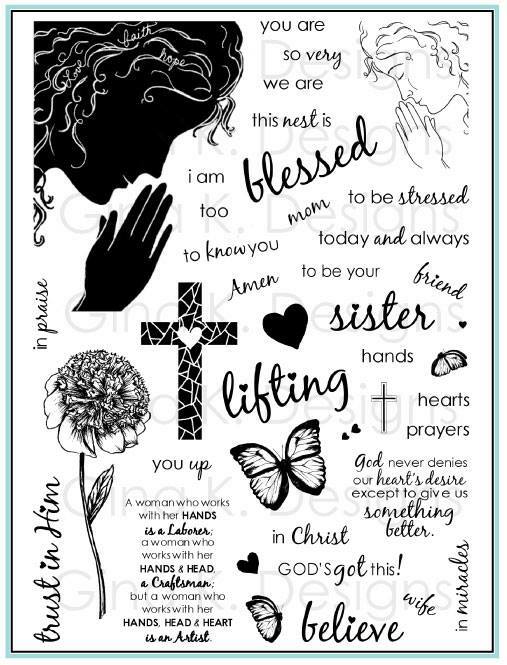 Begin stamping your silhouette image in Memento Black. Mask in the middle of the image with a straight piece of scrap paper and sponge above it to create the horizon. Rip some small "islands" from scratch pieces and sponge black ink into these negaative spaces. Place a die cut Nestabilities heart over the couple and sponged Pumpkin Pie and Regal Rose over it, when you remove the mask it will remain bright white. Remove masks. Rotate the heart a half turn and sponge around it lightly below the boat, remove the mask, then sponge over it in the same inks to make the lower reflection blurrier and more subtle. To give it a lot of contrast (and to keep from blinging it up too much for my sweetie!) I matted it in simple blacks and whites (Pure Luxury of course!) like an art gallery print. EK Success Curved Corner punches at the top and bottom. I'm so excited about all the love and support for "Sporty Accessories", thanks , woo hoo!! The tip sheet had to have it's own sample! :) Sorry for the delay, this post had a LOT of links to add!) Here, I trimmed up the cheer uniform (make it a summer dress or tennis outift!) to hang up, but I couldn't find my wire anywhere, so instead of twisting up a hanger, I used a french hook (for making earrings) and put a saftey pin through! Go nuts with this set to perfectly accessorize your attire and those sporty words from "Just So Sporty"! I've also incorporated gear to compliment many of the sports in the "Tee Talk" set. This set features stuff for sports year round and is perfect for cards and scrapping pages for boys, masculine, teens and tweens, and even girly cards with all the cheer gear! You will have a blast creating scenes with all the stuff. Stamp the lockers in a row using a gridline block for easy alignment (it's 3.5 inches tall,you can use the largest round fingergrip block Gina sells), to quickly create a locker room for the gymnasium or health club, perfect for an athlete, fan, or your workout buddy! Stamp the numbers from Just So Sporty onto the cheer top ("3,2,1...happy birthday! "), row of lockers, pennants for your team players numbers or to represent an ago. Give the lockers a pattern with the new "Ribbon Stripes". Tape a piece of white printer paper across the lockers and handletter a message with a marker, it will look a painted banner for "Spirit week", "Game Day" or "Summer's here!" Using a hobby blade, carefully cut around the top bottom and left side of the locker and score the right side to have a door that really opens! This can reveal something on the back of the door, sport accessories crammed inside (to the top if it's like my son's closet) or even the inside of your card. ::) Check out Theresa's fabulous pull card sample, complete with money holder!! Piece the inside of the locker with fabulous paper and add a little mirror. some taped up real photos of BFFs for a girly locker! Pile the sports accessories on top of a row of lockers like a shelf. Stamp the little words on each locker or write the recipients name on a label for each. Doodle graffiti on the lockers just like at school! Stamp fun little images on them like the heart from "Just So Hippy" or cover with stickers. Create amazing sports themed background papers stamping the different accessories and words in black, tone on tone, or color. Keep it to one sports theme for the purist or add a jumble of all of them for your All Star! Create really cool borders with the balls, or use the racket, club, stick, or bat in a row, alternating up and down so they "nest" together. Pop up the balls and accessories on pop dots to give your card more dimension. All the words can be stamped across the shirt. Many from "Little Tees", "Just So Sporty" and "Wee Tees" will fit as well. Go from fall to summer with a few quick snips: cut the sleeves and turtleneck off the outfit for a warm weather uniform. This way it also doubles as a tennis dress! Snip the outfit in half to use as separates. Use the hanger from "Little Tees" to hang up the outfit. Hang it on one of the locker vents. Do the same with your Tees and Sweats from the other sets. Add brads or metal dots to the center of the padlock. The large balls can all be punched out with a 1" circle punch. Go interactive with the balls and make a spinner card, your recipient is sure to get a "kick" out of it! Stamp the balls with a corresponding word from "Just So Sporty" onto the jersey or sweatshirt or t-shirts from "Little Tees". Make a sporty baby card by stamping the balls on the onesie from "Wee Tees"! The pennant and megaphone can both be rotated a half turn so that all four large greetings can be used on each. Love these sized-to-fit shape of this font! You can also stamp your other words from "Just So Sporty" or "Little Tees" on them. Create several pennants for your card front to look like the wall of a teen's or sports fan's room. Print out or write your favorite team name and stamp the pennant around it! Create beach themed projects and pages using the volleyball and swim goggles. Switch from "hightops" to "lowtops" by trimming off the tops of the sneakers. The four small words in this set can also be stamped onto the side of the football or basketball or on the end of the bat like a logo. Create a calendar with magnets or pushpin toppers with the balls to make a game and practice schedule for the family with the many sports they play. 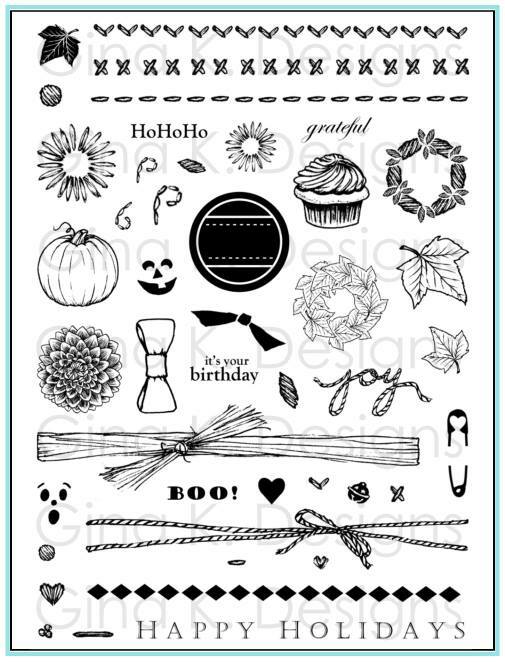 Cards and gift wrap for those tweens and teens that are so hard to find stamp images for sometimes!